1 What is Avascular necrosis? It is a condition characterized by cellular death or necrosis of the bone components that occurs due to interrupted blood supply. In absence of proper blood flow, there is death of the bone tissue which leads to collapsing of the bone. If the condition involves bones of a particular joint, it frequently causes destruction of joint articular surfaces. Although the condition can develop in any bone of the body, it mostly affects the ends of the femur, i.e. the bone that extends from knee joint to hip joint. The other common areas include upper arm bone, shoulders, knees, ankles, scaphoid (wrist) and talus. AVN affects both men and women equally. However, in cases which are related to systemic lupus erythematosus, the condition mostly affects women. Although it can develop in any age, most cases are found to affect individuals aged between 30 and 50 years. Nearly 10000 to 20000 people are diagnosed with AVN of femur head every year in US alone. In children, AVN of the femoral head is referred to as Legg-Calvé-Perthes syndrome. Sometimes no definite causes can be traced that lead to the development of AVN; such instances are said to be idiopathic. Prolonged and repeated exposure to high pressures has also been linked to the development of this disorder, although the relationship between the two is not clearly understood. AVN is usually asymptomatic during the earlier stages. However, with the gradual progression of the disorder, most patients complain of joint pains. At the initial stages, the pain is felt only when weight is put on an affected joint. Later on, patients experience pain even when they are sitting or resting. Onset of pain is gradual and can be only mild or severe. If the bone and its surrounding joint surface disintegrate, there can be a sharp rise in pain. This increased pain may make it difficult for the individual to move the affected joint, thereby leading to limited movement of the area. Disabling osteoarthritis might develop when the affected area is the hip. Groin pain can accompany an affected hip which is felt mainly during walking. If the lower extremity gets affected, a patient might limp while walking. As the ball collapses with the progression of avascular necrosis of the hip, the pain can persist after weight-bearing or rotation with walking. Some individuals experience the symptoms of AVN bilaterally, such as in both the hips and knees. X-ray images of the condition taken during the earlier stages generally appear normal. During the later stages, however, the images appear relatively more radio-opaque as the nearby bone is being resorbed secondary to the reactive hyperemia. Increased radiographic opacity is not shown by the affected bone itself as the dead bone cannot go through bone resorption, a process that is generally carried out by the living osteoclasts. 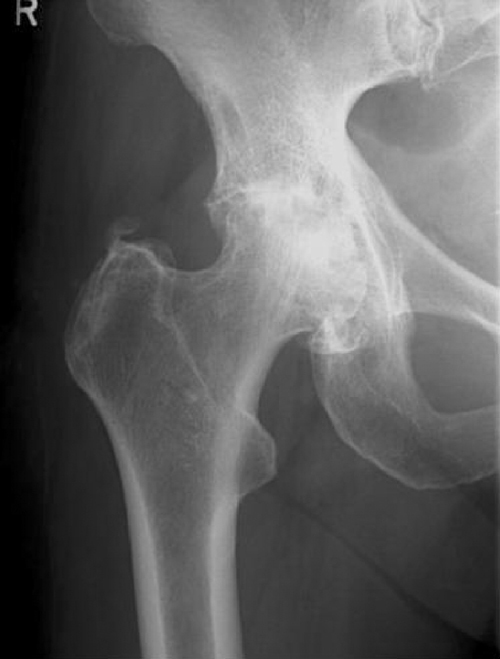 Late radiographic images show a radiolucency area after the collapse of the subchondral bone and the ringed areas of radiodensity that result from saponification and the calcification of the marrow fat after medullary infarcts. Generally, the doctors start with simple, nonsurgical remedies to manage the condition. These might include medications or certain other procedures. Unfortunately, although these procedures are able to reduce the pain temporarily, they cannot give rise to any lasting improvement. If the condition is diagnosed early, a physician might recommend reducing additional pressure from an affected joint. This can be accomplished by limiting strenuous activities or the usage of crutches. In certain cases, reduction in weight bearing might slow down the damage caused by AVN and allow natural healing. This treatment procedure can be combined with medications to avoid or delay any surgical procedure for some patients. Following a low-stress exercise program can help to keep the affected joints mobile and eventually increase range of motion in these areas. Electrical stimulation can be used to facilitate bone growth, and is known to produce good results when used prior to femoral head collapse. A number of surgical procedures are used to cure AVN. As most patients do not start exhibiting symptoms before the condition is fairly advanced, surgery is the main form of treatment in most cases. This procedure involves removal of the inner cylinder or inner layer of the bone that helps to reduce the pressure within the affected bone, increasing the blood flow and allowing the formation of more blood vessels. Core decompression is ideal for people who are still in their earlier stages of avascular necrosis, prior to the collapsing of the joint. This method of treatment can reduce the pain and slow the rate of progression of joint and bone destruction. This form of treatment involves reshaping of the bone to minimize stress on an affected area. It involves the removal of a wedge of a bone just above or below a weight-holding joint to reduce the pressure from the damaged bone. Osteotomy or bone reshaping might help in postponing joint replacement. It might take a long time for the patient to recover, during which the individual is advised not to be a part of any stressful activities. The procedure is mostly used for patients having early-stage osteonecrosis on a very small portion of the affected bone. Bone grafting involves transplantation of a healthy bone from one part of the body to another. It is frequently used to provide support to a joint after a core decompression procedure. In various cases, the surgeon will employ a vascular graft that includes a vein and an artery for increasing the blood supply to an affected area. Rest for a period of several months is necessary for an AVN patient to attain complete recovery. Arthroplasty or Total Joint Replacement is used to treat the late-stage patients of osteonecrosis whose joints have already destroyed. In this procedure, artificial parts made of plastic or metal are used to replace the affected joint. Total joint replacement is sometimes referred to as femoral head resurfacing. It is frequently recommended for individuals for whom the other efforts to save the joint did not yield satisfactory results. Various replacement options are available, and a patient should discuss his or her specific needs with the doctor. If ignored or untreated, AVN worsens with time. The bone eventually becomes weakened enough and collapse. Severe arthritis can occur if the bone’s smooth shape is lost. In any case, a patient may suffer from permanent decreased mobility and require complete joint replacement. The outcome for this condition depends on the area of the bone that is affected, largeness or smallness of the area involved, and how well the rebuilding of the bone occurs. Bone rebuilding is a normal process of the body and continual breakdown and rebuilding of bones take place at all times. This procedure maintains the strength of the skeleton and balance of minerals. However, AVN patients experience rapid break down of the bone tissues which are not followed by quick repair. Patients may enjoy full recovery after treatment or experience permanent damage of the joints with progression of the disease. Although it is difficult to say whether reducing the risk factors can ensure total protection from the development of AVN, following certain health tips can definitely guarantee an overall good health. Limited consumption of alcohol – One of the major factors responsible for the development of osteonecrosis is heavy drinking. Reducing alcohol consumption can minimize the risks of development of this disorder. Lowering the cholesterol levels – Small portions of lipids or fats can block the blood supply to the bones. Hence, blood cholesterol levels should be kept low. Monitoring usage of steroids – Doctors should be informed about any usage of steroids whether in the past or in the present. High doses of steroids, when taken repeatedly, can greatly increase the propensity for bone damage. These images will give you a clearer idea of the condition of the bones and joints affected by this disorder. 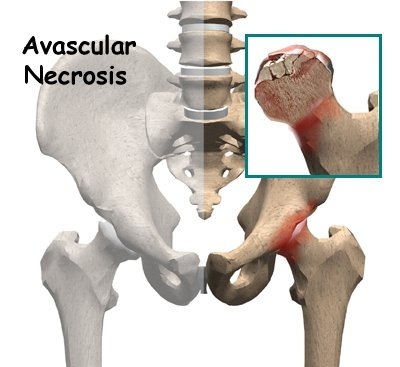 With proper treatment and rest, it is possible for Avascular necrosis patients to have a good prognosis.